Plenty of car shoppers have questions about the 2018 Ford C-Max Hybrid. We here at Ford of Upland have provided this Ford C-Max review. The car has plenty of good qualities, namely its efficient use of fuel. Once you understand all it has to offer, you’ll understand why owners love driving the Ford C-Max Hybrid every day. Feel good about driving the Ford C-Max, thanks to an advance powertrain design. Not only does it make highly efficient use of gasoline, the car also runs on electricity, making for an innovative solution. A 2.0-liter inline four-cylinder Atkinson-cycle gasoline engine is at the heart of this car. It works with an electric motor, which is attached to a lithium-ion battery. A generator helps provide additional power as you’re driving. This setup maximizes every last drop of fuel, so you can feel good about reducing pollution as you drive. Ford outfits this hybrid with a highly advanced electronically controller continuously variable transmission (eCVT). Not only does this not increase the Ford C-Max’s price, it adds value by providing a smooth, seamless delivery of power to the wheels always. Save even more fuel by using the EcoSelect button. Press it to conserve energy, and the vehicle will automatically soften acceleration, turn down heating and cooling, alter how the engine runs, and a few other items. All that adds up to savings and reduced pollution. The conservation-minded designs don’t end there. Regenerative braking captures energy that would otherwise be lost while slowing down or coasting, storing it in the battery. Just as important, Ford’s Brake Coach teaches you on the vehicles infotainment screen how to manage slowing down to make optimal use of fuel and electricity. A simple layout shows the percent of regenerative braking efficiency for your driving, so you can work on improving that figure day after day. You benefit from many other cutting-edge technologies for the Ford C-Max Hybrid. One is the available active park assist. It identifies parallel parking spots the vehicle can fit in, when you’re driving slowly. From there, you signal to take the spot, then the system will maneuver the car perfectly in place. MyKey helps you manage your vehicle better. The Ford C-Max Hybrid automatically recognizes what key is being used and puts in place any restrictions you ask for. It also allows for tracking how far your car has been driven by valets and others. 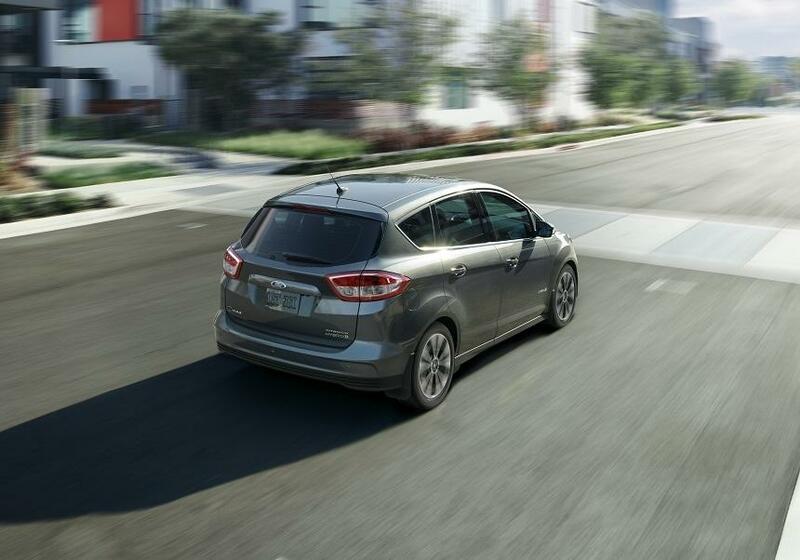 The Ford C-Max Hybrid isn’t just about cutting-edge technologies and saving on gas. It also has a layout and other designs that accommodate your needs each and every day. For example, the interior space is ample for up to five people to fit in the Ford C-Max Hybrid at a time. You can get either cloth upholstery or leather, depending on the trim level selected. Cargo volume is excellent, especially when you use the 60/40 split-folding second-row seats. In addition, hidden storage compartments in the floor of the second row allow you to stash personal items out of sight. Get the Ford C-Max at a price you can easily afford, plus learn more about its features by visiting us at Ford of Upland today.